Following last Thursday’s performance of Hamlet, the majority of the cast and the Associate Director Daniel Raggett joined the audience for an engaging and insightful Q&A. I had specifically booked to see this performance in order to be there for the talkback session and as this production has left me wanting to ask so many questions, I was thrilled that at least some were answered during the evening. It was also hugely impressive to see so many of the cast attend the Q&A after a four hour performance (I’ve included a full list of attendees at the bottom). This post sets out the questions asked and the responses as fully as I can. Who do they (the cast) think should have ruled Elsinore in the end? The cast all agreed that this was a great question and that it was hard to choose, but that the key was that these are exactly the types of questions Shakespeare is asking and for us to think about. The cast was asked about the choice of music within the production. The assistant director said that he couldn’t speak for the director Robert Icke, but commented on how he works instinctively and so he imagines it started with one Bob Dylan song and progressed from there. He also referred to Icke working alongside Laura Marling in considering the music to be used in the production. What were their thoughts about the perception of time and reality in the production? Angus Wright (Claudius) discussed this from Claudius’s point of view, saying that in his mind it’s all about Hamlet taking a different time to him, particularly with his grief for his father. Claudius just wants him to hurry up and get over it! Luke Thompson (Laertes) spoke of how for his character it’s all about it being the time to leave at the beginning. He is keen to return to France. 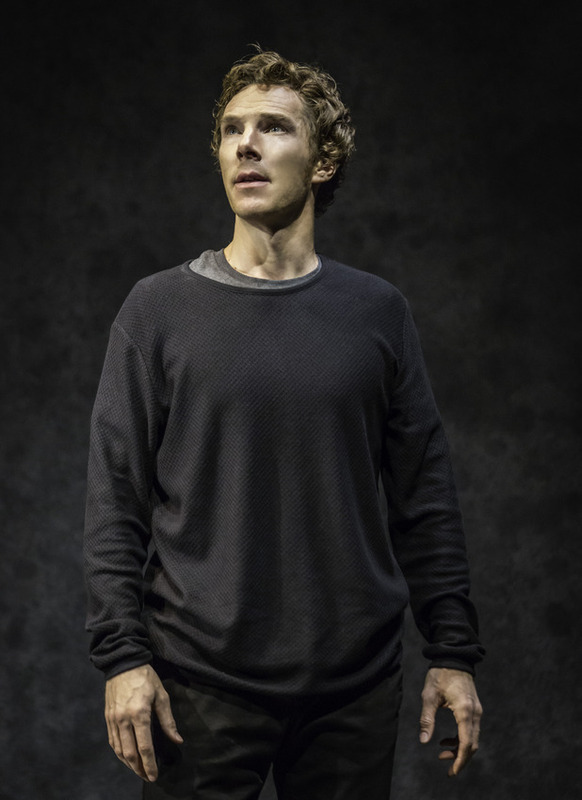 He also agreed that Robert Icke had taken a specific attitude to time and raised how purpose is a slave to memory, in that the more you let thought in to something and spend time thinking about it, the harder it is to act. I certainly agree with him that this is something that affects a number of characters in the play. Barry Aird (Gravedigger / Francisco) spoke about the sense that the Gravedigger is almost dreamlike; there is a sense that he is almost out of a different time to the other characters and he referred to it reminding him of the barman in the film The Shining. The cast were also asked about their thoughts on the striking image used for the poster and why it was chosen. Andrew Scott agreed with the audience member that there were links to Ophelia in the image (through the use of flowers strewn across Hamlet on the T-shirt) and he said that, in his opinion, there are a lot of similarities between Hamlet and Ophelia. He certainly believes that they really do feel love for each other and yet are forced to work out their parents’ problems, not theirs. He spoke about how cruel this is. He also made the important point that there can be no tragedy if there is no love (something in my mind that many productions of the play get wrong). Lastly, Andrew also made the point that the image could also signify either Hamlet (that is, the young man or his father) and the sense of stepping in to someone else’s shoes. A question was also asked about whether the cast think that theatre is still allowing people to come and be transformed by what they see, which in turn may enable them to use that energy to create real change in the world? Andrew Scott spoke about how it is important to Robert Icke that his plays are for now and mentioned the line from Hamlet which speaks of “the age and body of the time.” He also said how the play itself is full of love and compassion and how all of the cast is trying to understand each other and serve those emotions. Jessica Brown Findlay (Ophelia) commented on this issue too, making the important statement that if art stops being brave and starts apologising then we’re in trouble (well, she used a stronger term than that!) and that art can stretch over everything and unify us, which received a round of applause from the audience. Jessica Brown Findlay was then asked about why we don’t see Ophelia’s face as she speaks her last line (the person asking the question really wanted to see it). Jessica discussed how they had played around with the scene and that Ophelia looks around at all the people there. Ophelia has wanted to be heard her whole life and so this is her moment to be heard and look at all of those in her life. She hadn’t really thought about the fact the audience couldn’t see her at the moment, although Angus Wright (Claudius) said how it’s great for the other actors, as they can see her in that powerful moment. It was also raised that the production seems to have used scenes / lines from different versions of Hamlet, with specific reference made to the scene between Horatio and Gertrude (a scene which is only included in Quarto 1 (the “bad quarto”). Elliot Barnes-Worrell (Horatio) spoke about this scene coming from the “bad quarto” which is allegedly written by the actor who originally played one of the other smaller characters in the play. He commented that without this scene, you are left with the scene in which Hamlet recites a letter from Hamlet (one which Barry Aird (Gravedigger) said is quite dull) and so when Robert Icke found this scene in quarto one, Elliot was pleased that they could instead have a scene which puts Gertrude on team Hamlet and gives Horatio an ally at that point in the play. Joshua Higgott (Marcellus) also spoke about the importance of creating a world that fits the production and in this one, a scene about pirates wouldn’t have made much sense. Barry Aird (Gravedigger) also made the important point that Shakespeare should be treated as if a new playwright and I agree with him. The key to keeping Shakespeare’s work alive and relevant is to make it fresh for its audience and this production certainly does that. Reference was also made to the production’s modern parallels, such as the images of war and the cast were asked whether anything had any particular resonances for them. Associate Director Daniel Raggett said that it is their job to ask the questions for the audience to think about, while Amaka Okafor (Guildenstern) spoke about how she finds the setting of the production very domestic, which is important as it is about heart. She also commented that stories have the ability to span all political stories and events. David Rintoul (Ghost/Player King) referred to the scene in which Hamlet sees the Poles defending the small patch of land and how those lines about war could apply to so many places in the world today. Andrew Scott also talked about how wide-ranging a play Hamlet is, as it covers so much ground, from war, to grief, to love and so to drown it in one theme would be a tragedy. He also referred to people’s comments that the production was so long, saying that if it isn’t long, then you aren’t doing the play, as there is so much in it! Sadly, we then had to let the cast escape, despite the fact we could all have spent so much longer asking questions about the production! The full list of cast members attending the Q&A alongside Associate Director Daniel Raggett was as follows: Andrew Scott (Hamlet); Amaka Okafor (Guildenstern); Calum Finlay (Rosencrantz); Luke Thompson (Laertes); Jessica Brown Findlay (Ophelia); Joshua Higgott (Marcellus); Marty Cruickshank (Player Queen); Peter Wight (Polonius); David Rintoul (Ghost/Player King); Barry Aird (Francisco/Gravedigger); Elliot Barnes-Worrell (Horatio); Angus Wright (Claudius) and Juliet Stevenson (Gertrude). Thanks very much to the cast and creative team of Hamlet for a brilliant evening. All productions photos used in this post are by Manuel Harlan. 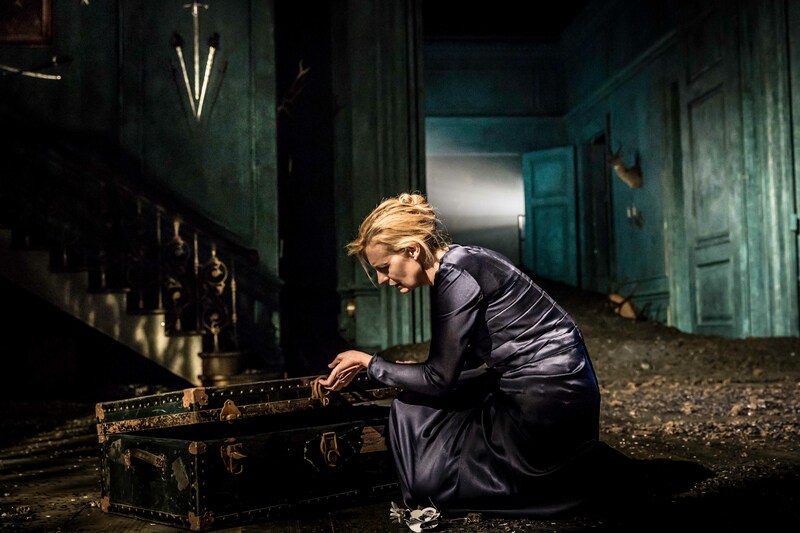 Hamlet continues its run at the Almeida Theatre until 15th April. Although advance tickets are sold out, seats occasionally pop up online and day seats are released each morning at 11 a.m, with returns also being a possibility closer to the show each day. The production is also transferring to the Harold Pinter Theatre from 9th June – 2nd September (albeit with some cast changes). For more information on the West End transfer, see the Almeida’s website here and the ATG website here. Hamlet is my favourite Shakespeare play and I’m always keen to see a new interpretation of this rich and powerful story. Over the years, I’ve never been quite as eager in advance of seeing it, as I was before my very first experience back in 2008 at the RSC. That was until the Almeida Theatre announced Andrew Scott would be taking on Shakespeare’s famous character in a production by one of theatre’s most exciting directors, Robert Icke. I knew this had the potential to be truly special and on Monday night, I was thrilled to discover that all my expectations had been met and surpassed! 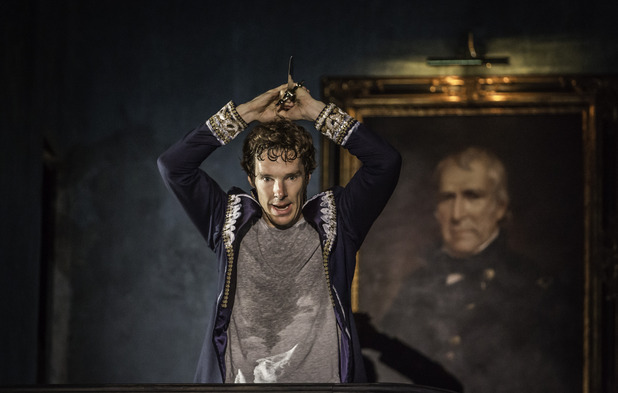 The key for me has always been that a great production of Hamlet must have more than a talented lead actor. The whole cast and the vision of its director need to be strong enough to bring Shakespeare’s story to life anew for the audience and this production succeeds in bringing together brilliant actors throughout the cast and a talented creative team, who together deliver a truly devastatingly emotional and thrillingly original experience. Before we talk about Andrew Scott (and there is much to say! ), I therefore have to talk about some of the many other performances in the ensemble worthy of praise. Juliet Stevenson follows Mary Stuart (also at the Almeida) with a fantastic Gertrude. Too often Gertrude is left on the sidelines of the play, but not here. She is a fully realised, flawed woman. 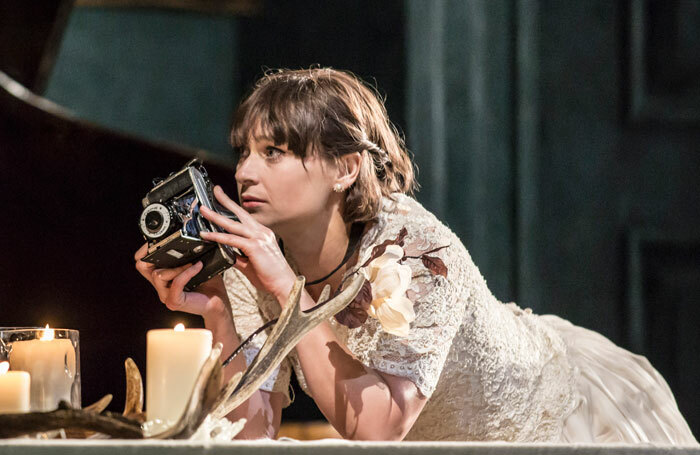 Thrilled with the idea that Claudius is attracted to her, she has been carried along by the passion of it and yet is still conscious of how Hamlet is suffering, in no small part because of her actions. The closet scene has always been a favourite of mine and in productions such a this, where Gertrude has a believable bond with her son, it is a joy to watch. Stevenson and Scott wring every ounce of emotion out of it and in a production where Hamlet feels truly capable of anything (frighteningly so in fact), the danger feels very real and Stevenson captures Gertrude’s fear for herself, as well as her heartbreak at her son’s mental state. Interestingly, this production also places her firmly against Claudius before Hamlet’s return to Elsinore, as we see her realise and accept the King’s villainy when Horatio puts it in front of her. I have never seen such a scene included in Hamlet before and found that it made her choice to drink from the cup instead of Hamlet, a cup she knows with certainty to be poisoned, all the more tragic. Her last act is to show her loyalty to her son over Claudius. 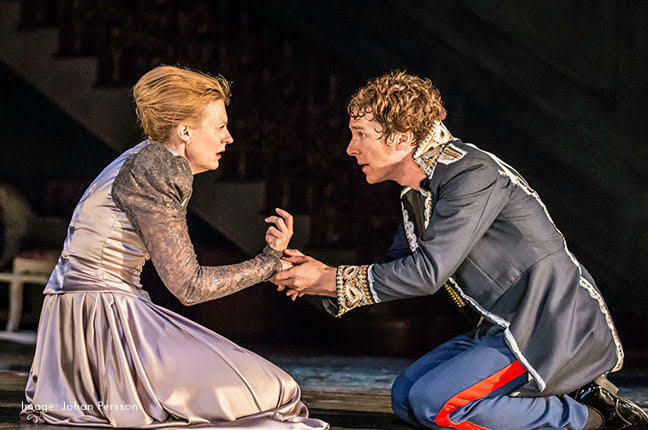 The relationship between Hamlet and Ophelia is also given much more stage time than other productions I’ve seen, which gives far greater life and depth to their connection. Seeing her comfort a devastated Hamlet, who breaks down in her arms once they are alone after the wedding party scene was agonising, yet beautiful. It grounded their relationship in reality and was one of my favourite moments in the production, ensuring a greater emotional resonance to the tragedy of what’s to come. Jessica Brown-Findlay is a strong Ophelia, who has a truly loving relationship with her father, ensuring her spiral in to depression following his death is all the more poignant and heartbreaking. Her descent in to such despair is also handled sensitively. She isn’t a wild, whirling woman in these moments, but a young girl who has lost a father she adored and respected and at the hand of the man she loved. Also and more so than in any other Hamlet I have seen, I found Rosencrantz and Guildenstern fascinating. For a start, they arrive much earlier than I am used to, which captured my attention! Hamlet has yet to “put on an antic disposition” when we first see them, suggesting that even before his father’s ghost appears to him, his behaviour is already causing concern. Not only that, but from the moment they arrive, there seems to be a tension between them and Hamlet, due to a potential love triangle. Amaka Okafor plays the female Guildenstern as a woman who clearly loves Hamlet and you have a sense that perhaps the two of them have a romantic history. Yet now it seems she is with Rosencrantz (played by Calum Finlay), which made for an interesting dynamic between the three. It also meant that certain lines carried much greater meaning, such as when Hamlet asks them to admit they were sent for if they love him, to which Guildenstern responds and also by giving Rosencrantz’s line “My Lord, you once did love me” to Guildenstern. Having two characters who are too often one-dimensional and marginalised actually catch my attention, is just one example of how Robert Icke’s production adds a fresh perspective to this well known story. Angus Wright’s Claudius is a modern political manipulator. He is calm and collected and carries an air of suaveness that you can see would have turned Gertrude’s eye. I also didn’t believe for a moment that he felt any remorse for killing his brother, which became so evident in his “prayer” scene. 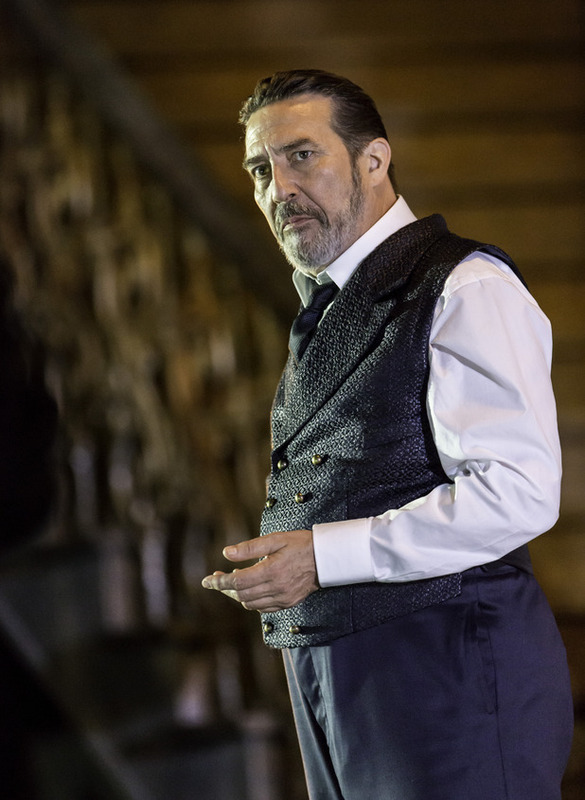 He may not have the same commanding presence as actors such as Patrick Stewart had in the role, but Wright’s portrayal makes clear that the King is a threat to Hamlet, which is essential to maintain the underlying tension as the play progresses (and which I felt was lacking in Ciaran Hinds’s version). 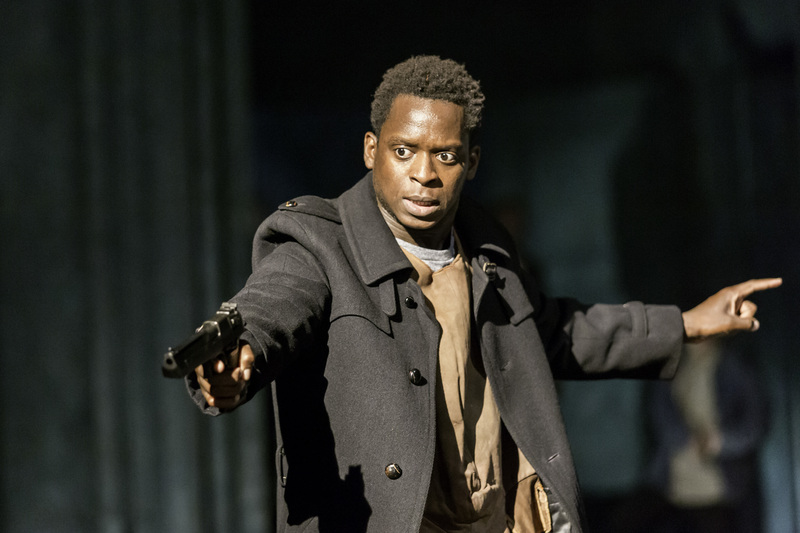 Elliot Barnes-Worrell is a wonderful Horatio, who has a believable friendship and loyalty to Hamlet. Often their bond is lacking, resulting in a less satisfying, emotional ending, but not here. Luke Thompson’s portrayal of Laertes is also enjoyable. Laertes is often a weak link, yet Thompson ensures he is a character you sympathise with. David Rintoul’s Ghost was another performance I enjoyed. Although his initial appearance in front of Hamlet is quite eerie, he isn’t a frightening figure. In fact his interactions with Hamlet are much more affectionate than every other production I’ve seen and it only emphasises just what Hamlet has lost. In light of Rintoul’s portrayal, the choice to miss out the Ghost’s bellowing commands from below the earth (a moment I always find rather silly and certainly didn’t miss) was a wise one! As you can see, I could say positives about this whole company (heck it even has the glorious Marty Cruickshank as the Player Queen! ), which is one of its biggest strengths. It does not have weak links, allowing the play to sing and for Icke and his cast to try new and imaginative ideas with the material. So, we come to Andrew Scott. I have been waiting for him to tackle Hamlet for years and he is superb. He is such a versatile actor and this is a performance that covers the entire spectrum of human emotion; one moment his Hamlet is filled with [frenetic energy], exploding with anger, frustration and grief, the next fragile and broken, seemingly utterly adrift in the world. He is also both hugely vulnerable and frighteningly dangerous, which was thrilling to watch. You believe Hamlet to be capable of anything, which provides the production of this 400 year-old play with a fresh tension and energy. Scott’s ability with the text is also fantastic. He may occasionally be a little too loud, but he found emphasis and humour in lines that I’ve never seen before (and in one particular case regarding Hamlet’s continual fencing practice, addressed a line that has always annoyed me, with perfect comedy). I have always found him to be a truly soulful actor in every role (especially on stage) and every soliloquy was so full of raw emotion that he held the whole audience under his spell. I found his delivery of the “readiness is all” lines particularly heartbreaking. His is absolutely a Hamlet you will never forget. Indeed, on leaving the Almeida, I was most struck by how original an interpretation Robert Icke has created. Having seen most of his previous work, it is always thrilling and thought-provoking and yet I was still surprised by how his version of Hamlet had me seeing scenes I know so well in a different light, which is a rare treat. Hamlet is such a rich story, that directors and actors always have the scope to play with it if they dare and it was exciting to see that Icke and his cast have done just that. I don’t want to spoil the cleverness of this production, but I will say that there are moments where a simple change leads to a whole new context for events that follow. The scene in which Hamlet considers killing his uncle as he is praying is one such example. The choices made on the Almeida stage in this scene were totally new to me and resulted in Hamlet’s crazed, frustrated, wild behaviour in his mother’s room making even more sense than usual, while proving that this Claudius is worlds away from the weaker portrayals of the character I’ve seen in other productions. Hamlet’s sense of loss is always evident from the outset and yet here it is added to further through his immediate awareness of the fact he is potentially losing Ophelia too, following her father’s command that she stay away from him. In a production where we have already seen him break down in her arms, this is another blow to him and you feel the weight of loss on Andrew Scott’s shoulders. It’s another example of where just a couple of small changes impact on the emotional heart of the characters in new and interesting ways. As for Polonius (played by Peter Wight), he is usually portrayed as either a comical old fool, or for actors unable to capture the comedy, a rather dry and dull character. He may not be my favourite Polonius, but I thoroughly enjoyed the fact that Wight’s version fits neither of these images. He is a loving father and indeed a useful adviser to the king and in the scene in which he is usually most comical – his conversation with Hamlet in which he is called a fishmonger, the production does not take the obvious and well trodden route of Polonius talking to himself or the audience. Instead, here he becomes a shrewd player in the surveillance world of Elsinore and it’s a wonderfully clever way to make the scene and the character feel fresh. The fact that Hamlet makes clear that he knows precisely what is going on too is also very well executed. The use of newsfeed-style footage for the scenes involving the Polish army and Fortinbras is also a wise choice, as these moments, although necessary for the wider plot, can drag the pace down. By including them in such a modern way, enables them to serve the plot, without losing the audience’s engagement. For example, we need Hamlet to see the Polish army in order for him to deliver the soliloquy it inspires, but here the focus is able to stay on Hamlet. Hildegard Bechtler’s set is ideal for this production. There are no huge, ornate sets, filled with lots of furniture, which needs moving on and off stage during key moments (yes, I’m looking at you Barbican Hamlet). Instead, it is a very stripped back stage space that reminded me very much of Icke’s Oresteia. Divided in to two sections, the front half is kept quite bare, with minimal seating, while a sliding door separates it from the back half, where events such as the wedding party can continue in the background, without distracting from the play’s biggest moments. This split stage is also used to beautiful effect during the play’s final moments, where the sense of death and its stopping of our time on the earth are so poignantly conveyed. I also loved the music choices made by the creative team. More dramatic moments were accompanied by a throbbing beat, which added to the sense of time running out for these individuals, while other scenes were accompanied by songs which captured the emotional heart of the moment. I especially liked the musical choice taken during the fencing scene, which again was something I’d never seen before in this play. As for the running time? Don’t be put off by it. Yes, it’s long, but as with some of his other plays, Icke’s three part, two interval structure and pacing ensures that you are swept along until the final scene. Simply put, this is how Hamlet should be – thrilling, dramatic, poignant, funny, heartbreaking and thought-provoking. With such a strong, visionary director and talented cast, it made me see the play with fresh eyes and engage with Shakespeare’s tremendous work in new and exciting ways. I am sure it will be one that is discussed and remembered long in to the future and although the 2008 RSC production will always hold a special place in my heart, this production is the only one I have seen since that could go on to become my favourite. I am already excited to see it again, which is exactly how a production of Hamlet should make you feel. If you already have tickets, you are in for a treat. If you haven’t, make the effort to get your hands on one. I promise you, you will not regret it. 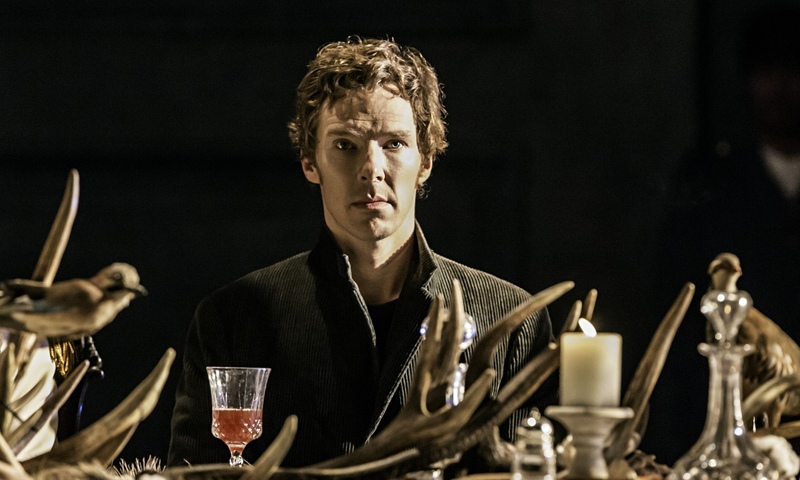 Hamlet at the Almeida Theatre runs until 15th April 2016. Although tickets have sold out, there will be day seats on sale each morning at the box office and it is also worth trying for returns a few hours before each performance. Running time is 3 hours 45 minutes (including two 15 minute intervals). For more information, visit the theatre’s website here.